With a rare free Sunday to myself, I began perusing the internet for upcoming events, and found that the Going West Writers Festival is soon approaching again. 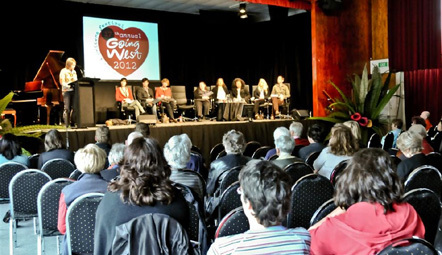 Last year, all University of Auckland MCW students were invited to read part of their project. I felt like I was doing to faint, and read a snippet from my novel (below!). Somebody wolf-whistled when I finished. I clicked on the link, surprised to find that the photo they’d used is of me at the podium. If I can spare the time, I’ll go to this again. There’s something inspiring about listening to other writers speak about their work. When Kathryn awoke the world looked peaceful, shadowy yet sparkling. The last trailing tendrils of sunlight slid across her face and lit the tips of the branches above her – which shone like tiny, golden crowns – and she thought that she was dreaming. But then the light was gone and only shadow remained, and the cold ground was suddenly too hard, too real. Shivering, Kathryn rubbed her legs. They were bare! She wore only underwear on her bottom half! Panic-stricken, she then remembered. The stick hut… the fire. Those people. They’d all been real!? The thought sank like the heaviest mud. Dead. No more. Gone. It seemed impossible – some sort of joke, maybe – but when she slowly, painstakingly, began to draw fragile recollections of the previous day like poison from her subconscious, there was a point when they simply ran out. She wrapped her skinny arms around her knees and tried, strained to remember something further. Oh my God, Mum! Kathryn imagined her mother, sitting behind her desk, receiving a phone call from the police. She’d pick up that gaudy green receiver, shaped like a frog’s head to amuse her young patients, and hear a strange, gruff voice on the other end. She‘d listen, calmly at first, nodding like she always did when she spoke on the phone, even though the speaker couldn’t see her. But then her shocked expression would break – her face would break, the many lines around her eyes and mouth cracking until she lay in little broken pieces on the floor. Kathryn started to cry.No, no no!It wouldn’t have happened that way. They wouldn’t have told her mother over the phone! A doctor, with a white mask over his mouth and blood on his gloves, would meet her parents outside the surgery room door. Her mother, angry and worried, would ask, accusingly, “What was she doing outside of school? Tell me that! She’s a good girl, she’s never done anything wrong!” And the doctor would drop his head and say that he was very sorry. The words echoed in her head, making less and less sense with each resounding. People don’t really die and go somewhere else. They just die. Wasn’t thinking about your own death some kind of contradiction? Because if you’re thinking then you’re alive. She wiped the tears from her face, the furnace of fury that stood fuelled but unkindled within her suddenly given a spark. Abi and the others – they were lying to her! She’d been kidnapped and fed a terrible story. The sick bastards! Did they think she was that stupid? Trembling all over, she sat back down, the ground gritty beneath her palms. Death… She’d presumed that eternity stretched away on either side of her, with pre-aliveness to the left, post-death to the right, a short window of being in the middle. It had always seemed so wildly imbalanced, but then why should it be any other way? She felt her pulse – familiar, and amazingly reassuring. Like the reflective posts at the side of a highway that flash by again and again on a dark night, her heart intended to carry on. And it seemed that the highway stretched on now, maybe forever… She’d simply been placed further along the road.